Randy, Jane, Mike, and Jodi spent 3 days riding through SW Wisconsin and NE Iowa the weekend of June 29th.Jane, Mike, and Jodi had several firsts on the ride. First it was Mike and Jodi's first ride on their new to them Kawasaki Voyager. 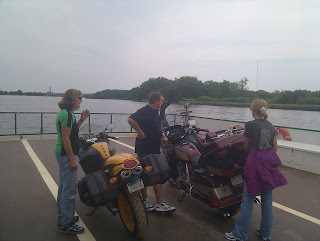 We left in the rain on Friday but by the time we got to Breitbachs for lunch it was starting to clear off.Great buffet there and then on to the ferry to cross into Cassville (another first). Made a quick stop at Potosi Brewing Company before riding on to New Glarus and a night at teh Chalet Landhaus. Saturday we toured the new New Glarus Brewery, then to My Horeb for a light lunch at the Grumpy Troll. We spent the Saturday night at a B&B in McGregor and had supper at the Old Man River Brewing Company. Then to round off the weekend we stopped at Pikes Peak State Park before heading home.